Erba' Pjazez will be kicking off this Saturday at 7pm. Next Saturday, don’t miss Erba’ Pjazez, the spectacular launch party for our European Capital of Culture year, kicking off at 7pm. In order to avoid confusion and congestion during the evening, it is highly advisable to pick a starting point in advance. It is important to note that access to REPUBLIC STREET, ARCHBISHOP STREET, MERCHANT STREET, ZACHARY STREET and GIROLAMO CASSAR AVENUE will be flowing in one direction only for the public. If you’re arriving to Valletta from Birgu by making use of the Ferry and the lift, we recommend starting from Castille. 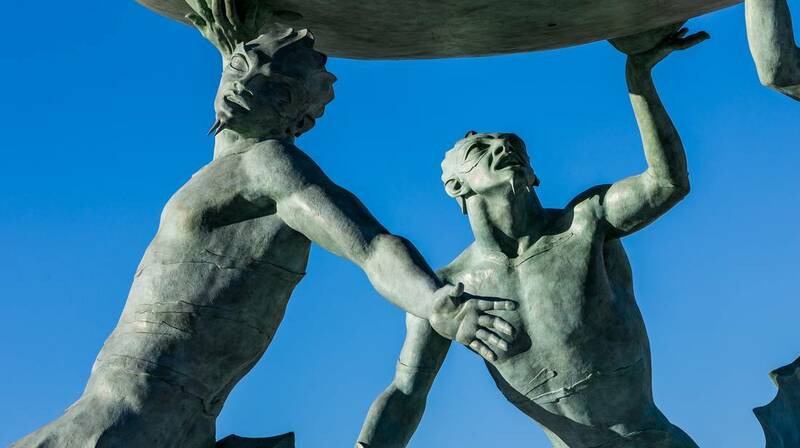 If you’re arriving to Valletta from Sliema by Ferry, we recommend starting from St George’s Square. It is important to follow the crowd flow. You can always pass through one of the side roads in between, but it is important to walk through the mentioned route in the roads indicated on the map. 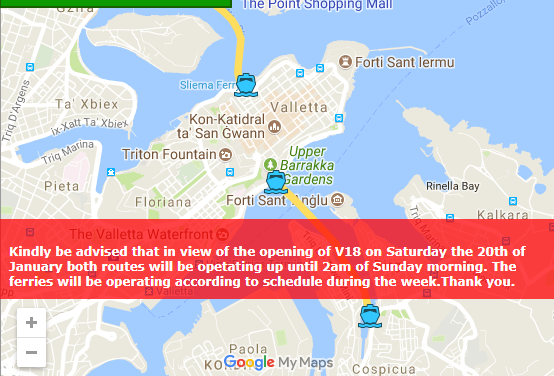 Vehicles will not be allowed access into Valletta after 5.00pm, except for Public Transport vehicles. Public Transport is highly recommended. 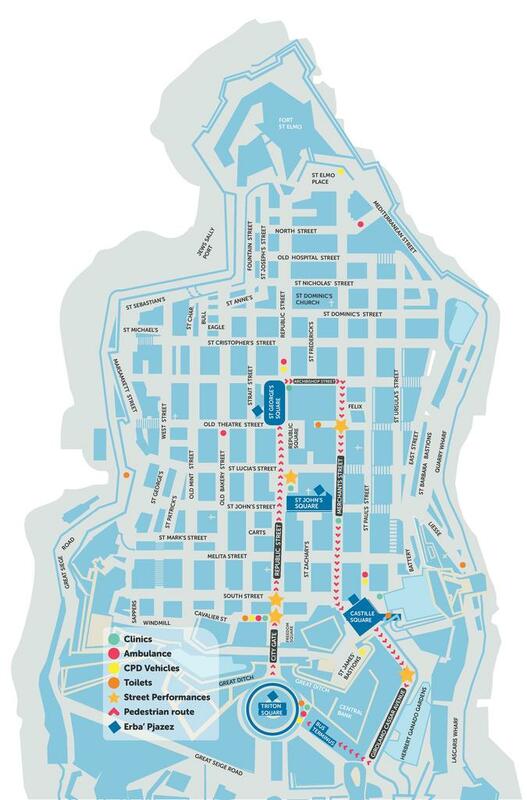 Valletta registered vehicles can access the city from the DECEMBER 13TH ROAD UNDERPASS and through WATERFRONT. Buses will drop off passengers at the FLORIANA MALL, and buses can be boarded out of Valletta from ST ANNE STREET till 2.00am. Sa Maison Hill will be turned one way downhill (except for emergency vehicles). Taxies will be stationed in the car park opposite to the Phoenicia Hotel. Coaches and Minivans will make drop offs in Sarria Street. In addition to this, Gozo Channel have announced that the Company will be performing additional trips during the night of 20th January 2018 till the early morning hours of Sunday 21st January 2018, leaving Mgarr, Gozo at 23:15 and 00:30 and departing from Ċirkewwa, Malta at 00:00 and 01:15. The other trips will remain according to the official winter schedule. Everyone is invited to experience the music, dance and inspiring performances that are set to light up four main squares in Valletta: Triton Square, St George’s Square, St John’s Square, and Castille Square. Each square will be hosting a twenty-minute kick off show at 7pm, with encores every hour, on the hour, up until 11pm. A massive concert/afterparty organised by Tenishia (Joven Grech) and the Malta Philharmonic Orchestra will close the celebrations in St George’s Square at 11.30pm.